Martin Luther was originally an Augustinian friar, a Catholic religious order. As time went on, he moved away from some of the core Catholic teachings, insisting that the Bible was the only source of knowledge from God. He believed one could not purchase or earn through good deeds his way to salvation – it could only be attained through the acceptance of the sacrifice of Jesus Christ. His teachings put him at odds with the Roman Catholic Church and the pope, writing his Ninety-Five Theses in 1517, when confronting the Dominican friar, Johann Tetzel. Tetzel was a Grand Inquisitor of Heresy to Poland and was in the practice of selling indulgences for money in exchange for freedom from God’s punishment of sin. 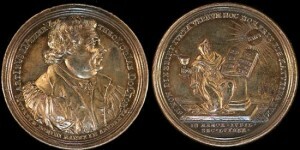 This is a category of martin luther coin. From 1510-1520, Luther preached about the sections of the Bible dealing with penance and righteousness. His focus was to show Christians that they are their own source for redemption and not the Roman Catholic Church, which he increasingly determined was corrupt and misleading. In response to Luther’s Ninety-Five Theses, Pope Leo X took the next three years slowly working on messaging counter to Luther. Sylvester Mazzolini presented a heresy case against Luther, which resulted in Luther being summoned to Rome. It was determined Luther would be examined in Augsburg at the Imperial Diet – the assembly of the imperial estates of the Holy Roman Empire under Charles V. During the questioning in 1518, Luther stated he did not consider the papacy part of the Catholic Church because historical interpretation of the Bible concluded the papacy was the Antichrist. This devolved into nothing more than a shouting match and although the papal legate at the hearings, Cardinal Cajetan, was instructed to arrest Luther if he did not recant his Theses, Luther ended up escaping during the night. In 1519, the pope decided on a less confrontational approach to undermining Luther. In Saxony, Luther made concessions to the papal nuncio and promised to remain silent on issues if his opponents did as well. Johann Eck, another theologian, made it his mission to draw out Luther and expose his doctrine. During June and July, Eck staged a dispute with one of Luther’s colleagues, Andreas Karlstadt, and asked Luther to mediate. 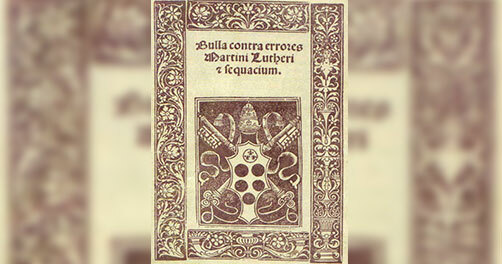 Luther asserted during the debate that since the papacy and church councils were fallible, they did not have the sole right to Bible interpretation. Eck branded Luther a heretic and set out to destroy him. In June, 1520, the pope began issuing bulls to change Luther’s mind. Leo warned Luther in his bull “Exsurge Domine” that he needed to recant 41 sentences from his writings within 60 days or face excommunication. Eck proclaimed the bull in several cities while Karl von Miltitz, another papal nuncio, tried to broker a solution. On December 10, 1520, Martin Luther publicly burned the papal bull, resulting in his excommunication by Pope Leo X on January 3, 1521 via his bull “Decet Romanum Pontificem”.